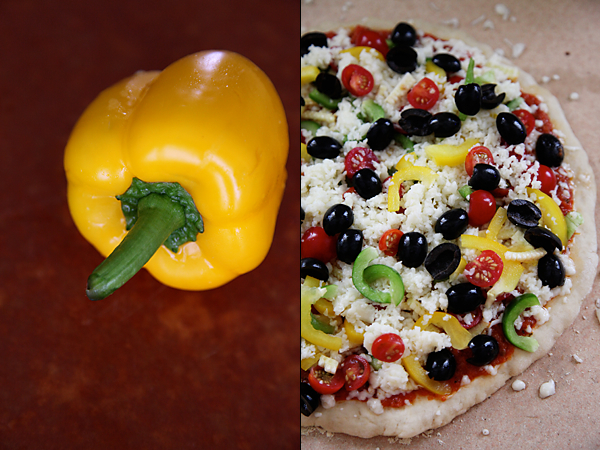 In many ways I have learned that making a pizza is like constructing a piece of art. The base of the pizza is like the foundation of the art form. And in this case it needs to look right, smell good and taste great! Once you have the dough in place you can roll the dough thinly to make a thin crusted pizza or into medium thickness to have a crusty base and a little bit of spongy bread like texture, like I have here. Or roll the dough thick to bite into fluffy and soft pizza. Next comes the sauce. Firm ripe tomatoes, adequately spiced and herbed turn into tangy goodness with just a hint of sweet to balance the sour flavours. The sauce is the perfect foil between the base and the toppings. 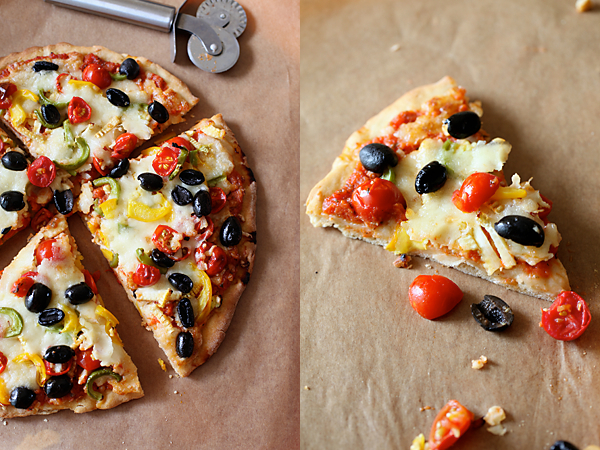 You get it right and you get a perfectly balanced pizza. Then come the toppings. Colourful embellishments with different textures artistically arranged over the sauce is like the finishing touch to this masterpiece. Alas! I was hard pressed for time as I was in a rush to go and pick up my 3 1/2 year old from nursery and I sprinkled the toppings I chose in quick succession before I placed my pizza stone into the oven and closed its door shut. A little bit of time on hand can mean more elaborate decorations in terms of your artistic expression. Remove the toppings and just do the base with the sauce and cheese and you have the classic pizza margherita which Im sure would make Hari a very happy boy. But I’m also pretty sure that I would never make it unless I had a vegetable soup as an accompaniment to it, the vegetable lover that I am! I really enjoyed making this pizza for my family and served this with pasta in lemon sauce and some roasted pumpkin and beans. It created the perfect base, a great sauce and the toppings of my choice alongwith the cheese made a harmonious blend of taste and textures. And what’s not to love in such endeavours which make oneself and the loved ones happy? You can use wither plain flour for the base or 50% plain flour and 50% whole wheat flour as I have suggested below. 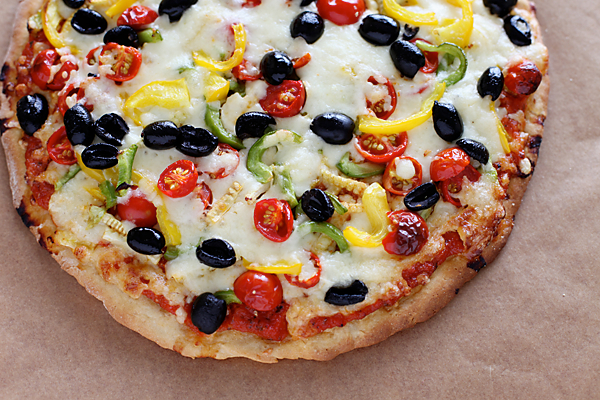 You could also use a variety of thinly cut vegetables like eggplant, artichoke, zucchini as the topping for the pizza. 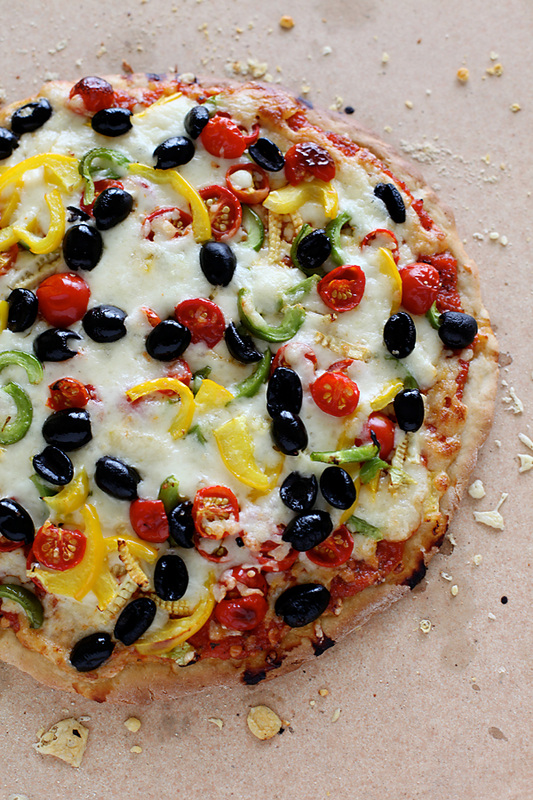 Skipping the vegetables and just using the cheese makes this a pizza margherita. *There are different kinds of yeast available and please note that I have used instant yeast here. In a bowl put in the yeast and sugar, mix and pour in the lukewarm water. Allow to stand for ten minutes until the mixture froths and bubbles appear on the surface. In the bowl of a stand mixer, put in the both flours and salt. Mix using the paddle attachment. Put in the yeast mixture and mix again until the dough comes together. You might have to use two or three tablespoons of additional water of the dough is very dry. Put in the dough hook and knead for 3 to 4 minutes until the dough is smooth and elastic. Alternatively use a food processor or your hands. If kneading the dough with your hands, you will have to do so for 8 to 10 minutes. Form the dough into a ball and place it in a lightly oiled bowl. Put the bowl in a warm place for about 30 minutes or more until the dough doubles in size. Punch down the dough and form into a ball. Place the dough on a flat surface and using a little flour beneath and above the ball of dough and roll out the dough into a 10” (25 cm) circle. In a wok or a pan, heat the oil. Stir in the asafetida and the tomatoes. Put in the all the remaining ingredients, the herbs, sugar, pepper and salt and cook on medium low heat, until the sauce becomes thick stirring in between to prevent scorching, about 12 to 15 minutes. Allow to cool. 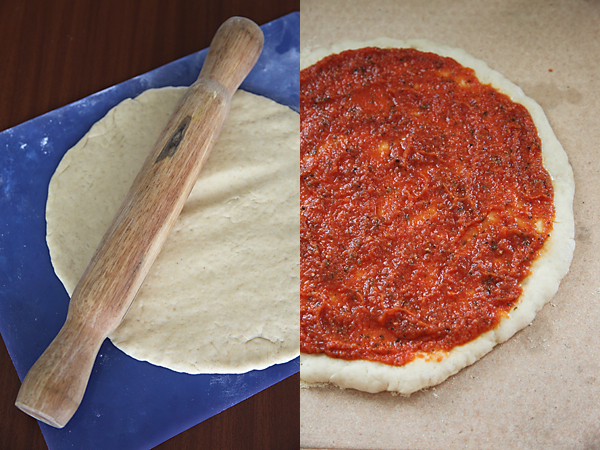 Place the rolled dough in a pizza pan, a tray or a pizza stone. * Spread the sauce over the prepared pizza base leaving 1/4” of the border uncovered. Sprinkle half the cheese over the tomato sauce. Arrange the remaining toppings of your choice over the sauce. Spread the remaining cheese over the toppings. 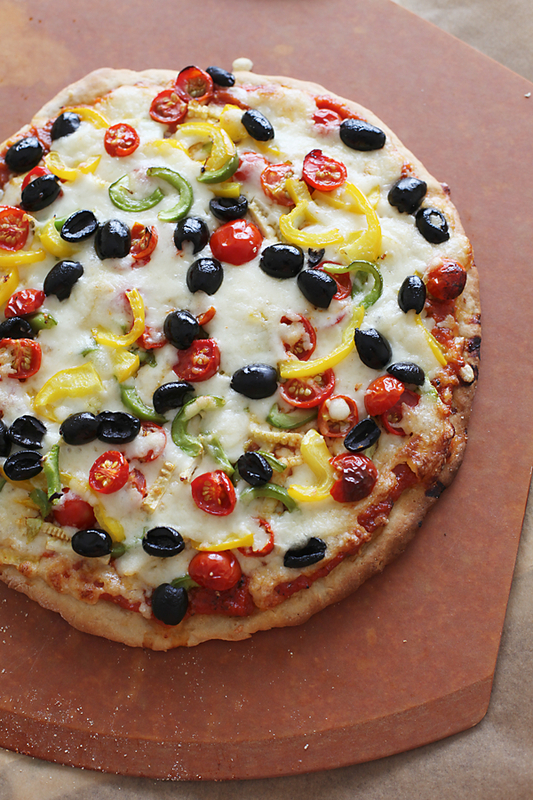 Brush with a little olive oil all over the pizza. Bake in a pre heated hot oven at 220 C/400 F for 15 to 20 minutes or until the the crust is golden brown. * If using a pizza stone make sure that you heat the stone for atleast 30 minutes before making the pizza. It has to be hot! And allow it to cool carefully to room temperature before you clean it. Also, it has to dry thoroughly before you place it back in a hot oven or else it would crack. Finally!!! I'm so glad to see this on divinetaste. In fact, I just made an eggless pumpkin pie based on your recipe and it's turned out to be awesome! I'm waiting for my girls to be back from school for them to cut it 🙂 It's perfect for fall! I tasted a bit as I couldn't stop myself 😉 it's awesome!! Now, I'm defi going to try your pizza. Could you please tell me what tomato purée to use – fresh tomatoes crushed in a mixer? Pizza looks delish!!! Especially with all the toppings..
Iv read in many places that the order of toppings should be sauce, cheese, and then the rest of the veggies.. and having tried it, I can vouch that it makes a huge difference. The veggies retain their crunchiness, and the cheese and sauce meld together beautifully.. Also I recently tried rocket on top of the pizza, and it was delish! I am a silent follower of your blog. I just love your recipes..simple and so very delicious. Have tried few cakes & muffins & few other recipes, and most of them have come out great. I'm definitely going to try this recipe asap. Which brand mozzarella do you use? Could you email me recipe of pasta & lemon sauce which you had for lunch ;)). Hubby b'day is coming, and since he is a pasta lover would love to make it. Could you please help and suggest me on good brand of mixer grinder. NSJ: Yes..finally! After you wrote to me, I definitely had you in mind when I made this post! It is better to use fresh tomato puree. If this is a problem then use tinned. Thanks so much for your kind words. Nina: The frozen dough should be taken out and kept in a warm place for the yeast to awaken from its sleep. Did you leave it out long enough before baking it? Revati: You are right and that is what I have used here. Only, I have saved a extra cheese and topped it up again. 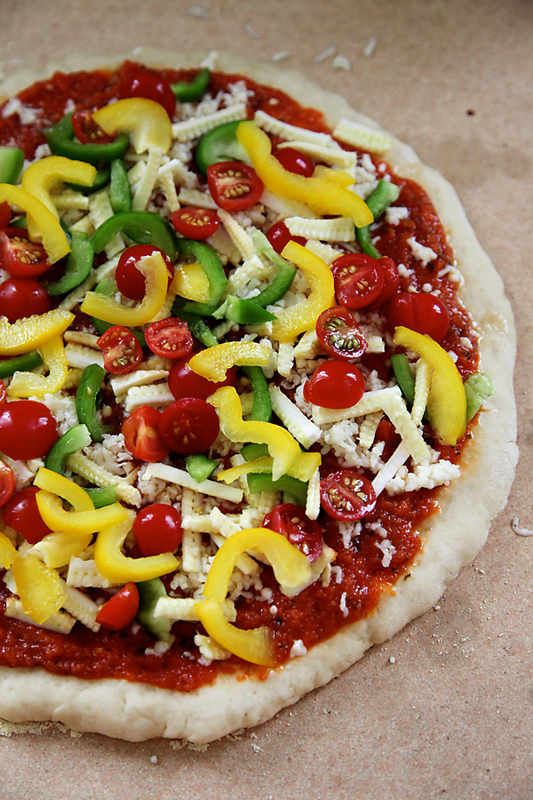 Also, it is important to brush the tops of the vegetables with olive oil to prevent them from drying out in the oven. Pallavi: I use Imperio natural mozzarella. Philips, Morphy Richards and Preeti are all good brands. Compare the features and see what exactly you are looking for. Hope this helps! Colourful. Wonderful. Simi and I are thinking of making this tomorrow. Thanks, Anu. How sweet of you to think of me.. I'm so touched 🙂 I never use canned tomatoes too.. But should I strain the purée after crushing it or just use it as is? Bhavana: 🙂 I'm making modaks for Ganpati, the steamed ones. Mihir: That's awesome! What's better than cooking together? Let me know how it went! I loved all the recipes on this website. Your photography skills are superb and ofcourse all your recipes are not messy, simple and taste delicious. I had a question for you, What kind of oven do you have in India? Especially, for cake and pizza. Do you use normal microwave in convection mode or a cooking range oven? how different is this from your earlier recipe for Pizza base? Wow awesome Anushruti… very inspired to try it out as with all your other recipes! Tried the Makhana recipe yesterday, have been looking for makhana in kirana stores ever since I read your recipe.. It came out great, what and awesome nutritious snack! Thanks for helping me discover this gem..
Could you post modak recipe also, the steamed variety? I love those, everybody here in Pune seem to make the fried ones for the Ganesh festival. The pizza looks soo good, I too love making homemade pizzas, they come out so much more tasty and flavourfull! Oh..have been waiting for you to write the pizza recipe especially the base sauce one for ages…thnx ..will surely try out..
Amruta: Thanks for your kind words. I don't use either and in fact never use a microwave oven for anything. I have a Siemens built in oven and an OTG. OTG's are very popular here for baking. Divya: They are similar yet different in terms of yeast and proportions of olive oil, sugar, etc. Sreeja: Thanks for your note and glad you enjoyed the makhana snack. I love it too! I just made the steamed modaks today and was in no mood to shoot them. Whenever I make them next I will surely post it. Myself Ashwini .. I am regular reader of ur blog , ur blog is very informative with good photographs . I would like to ask u Can u pls suggest me a good book on Ayurvedic balance diet? Awesome! this is one of the most wanted recipes! As some else requested above, Could you also pls let me know the recipe of pasta in lemon sauce ? Would like to try both one day for a complete itallian lunch! How do you make the 'pasta in lemon sauce and some roasted pumpkin and beans' mentioned in this post? We had this pizza for today's lunch. What a treat it was to make and eat it! Thank you so much for a mouth watering recipe. Is it necessary to use 'Olive Oil'? How would the taste differ if I use vegetable oil? neha: Italian food is generally made with olive oil and olive oil imparts a special flavour to ITalian food. If you dont have it you could substitute it with any neutral smelling vegetable oil. If a recipe calls for olive oil being used raw then it might not be a bright idea to substitute it. wow! Great Pizza!! Seems like Italian pizzeria pizza. At home we usually make a squared pizza that we cut in 6/8 pieces, and it is usually thicker, because we cannot make a restaurant-like pizza at home. But you did it! Congrats. 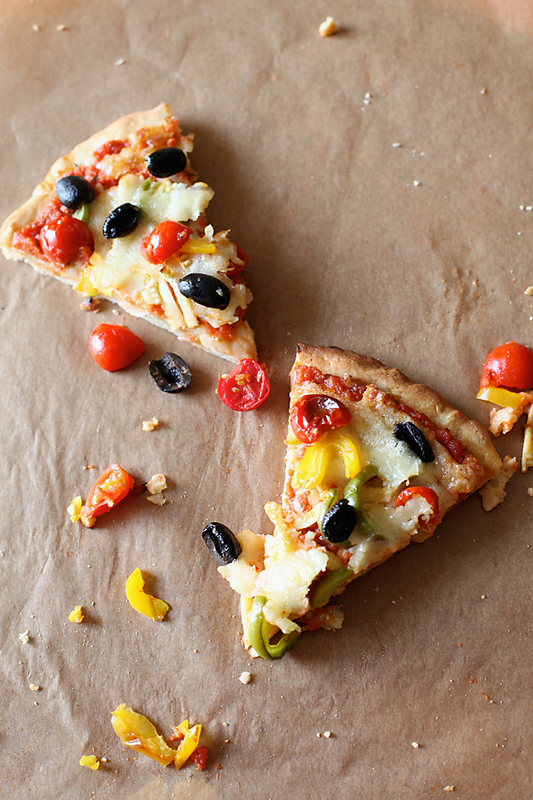 I love pizza with mozzarella and parmesan cheese because it creates a tasty little crispy crust! I like all your posts specially the eggless ones. Keep up the good work.